The first major reduction sale from the Sandyford herd of pedigree Ayshires on behalf of Blaise and Deborah Tomlinson and family, Loughborough, at Beeston Castle topped at 7,400gns. Sandyford Mayflower 14 tops the sale at 7,400gns. This was for Sandyford Mayflower 14, an EX92 daughter of Mapleburn Remington, the reserve champion at last year’s Ulster Winter Fair which sold dry and due to calve her fourth next March. The buyer was the herdsman at Sandyford, Graham McMillan with the Tomlinsons retaining a half share. 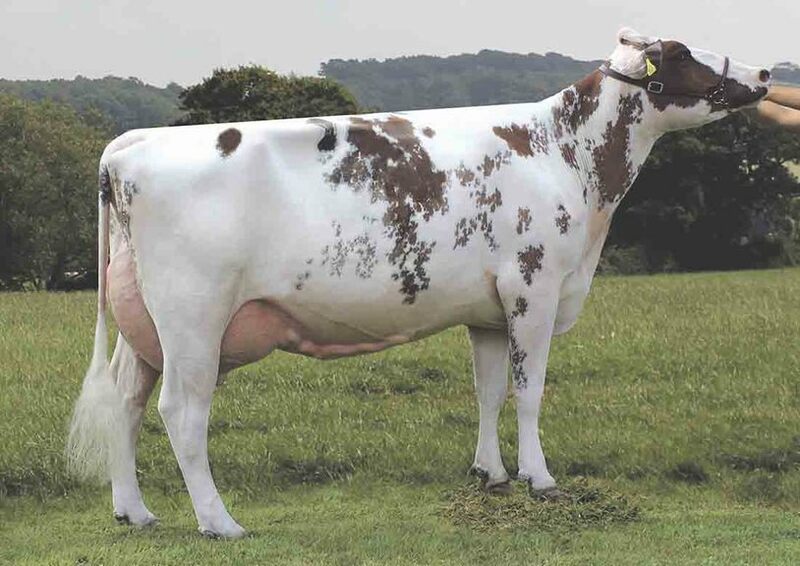 At 6,800gns was the heifer, Sandyford Dark Fable, a daughter of Sandyford Dark Night and out of an EX95 dam, which calved at the end of August and scored VG87-2yr just two days fresh. It sold to the Fable International Syndicate of UK-based New Zealander, Brent Carruthers, Shrewsbury; Alan Timbrell, Cirencester, with the Tomlinson family again retaining a third share. Selling at 5,300gns was the Nexus Dreamer daughter, Sandyford Dreamy Bella, one of two animals in the sale with a VG89 maximum score for a second calver. It sold to Phil Reed, Cardigan. Three animals made 5,000gns. The first was Sandyford Tri Ella, VG85-2yr a daughter of Burdette with one EX and five VG sisters, which sold to Phil Jeffries, Welshpool. Also at this price was the yearling heifer, Sandyford Vitality Clover, a granddaughter of Clover 10, out of the Ex94-3E Clover 12. The buyer was Geraint Thomas, Carmarthenshire. Also at 5,000gns was another yearling heifer, Sandyford Burdette Clover 3 which sold to Mr Carruthers. Its ET sister, Sandyford Burdette Clover 4 sold for 4,000gns in a two-way split to A. and .S Lawrie, Cuthill Towers and Gavin Lawrie, Brieryside. Sandyford Burdette Penelope, the other animal in the sale to score VG89 maximum score for a second calver, sold for 4,000gns to Mr Carruthers.